More than 4,600 members of Harvard’s largest labor union will not see deductibles or coinsurance in their healthcare plans for at least three more years, in a tentative contract agreement reached this week. The deal marks the end of nearly a year of strained negotiations between the University and the Harvard Union of Clerical and Technical Workers (HUCTW), which extended four months past the expiration of the previous three-year contract in September. 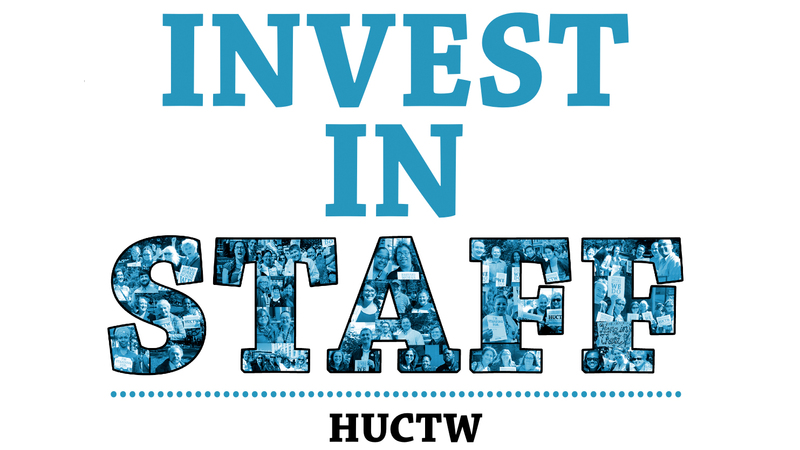 HUCTW members will vote on contract ratification February 25. A typical HUCTW member will receive annual raises of 3.4 percent, consistent with the pay increases provided to workers under the previous contract. Before the financial crisis, HUCTW workers received notably higher annual raises, averaging 4.5 percent between 1992 and 2009. Adjusted for inflation, which currently hovers around 1 percent in the Boston area, the raises negotiated in the new contract more closely mirror raises workers have received historically. “All HUCTW members will enjoy raises significantly greater than the current general inflation rate,” according to an e-mail sent by the union to its members. Still, “Inflation numbers don’t capture a lot of the micro-factors that can hit hard on our members, like the extremely high increases in rental housing in the Boston-Cambridge area,” HUCTW director Bill Jaeger said in an interview. About half of HUCTW workers say they have “very little left over” after paying their bills and basic expenses, according to a 2015 survey of the membership. “Both parties came to these negotiations in good faith and we are pleased that our work produced an agreement acceptable to both sides,” University executive vice president Katie Lapp said in a statement. Covered workers won’t have to pay healthcare deductibles or coinsurance—a major sticking point in the negotiations. Employees instead will see increases in copayments for office visits, prescription drugs, and hospital stays, beginning in 2017. The contract also creates a new healthcare tier for workers earning less than $55,000, or about 40 percent of HUCTW members, who will pay the least in monthly premiums. Currently, the lowest tier includes all workers earning less than $70,000, who contribute 15 percent of the cost of their premiums. Beginning next year, the sub-$55,000 tier will contribute 13 percent. The change will save workers in the lowest tier about $150 annually for individual plans and $400 for family plans, Jaeger estimated. The deal also includes union concessions on retiree health benefits: future hires and workers who are far from retirement will see increased premiums. “Our union and the University have been going at each other on questions of health-plan design in an unproductive way for five years now, and it’s gratifying for the whole community that this seems like it will work for everybody,” Jaeger said. HUCTW members have feared that the University would expand cost-sharing in its union plans, after the introduction more than a year ago of deductibles and coinsurance to the University’s health coverage for faculty and nonunionized staff members. The changes provoked sharp criticism from some employees, who feared that increased cost-sharing would discourage lower-income workers, postdoctoral fellows, and junior faculty members from seeking necessary medical care. The administration answered these concerns by introducing a fund to defray some of the extra medical costs that might be incurred by lower-paid beneficiaries, and, in the current year, offering a higher-premium-cost coverage option with less cost-sharing. The 2016 benefit plan also made the cost structure of health premiums more progressive: for 2016, nonunion employees earning up to $75,000 are eligible for the largest University subsidy of their monthly premiums, up from $70,000 since 2007. Still, premiums rose by more than 7 percent across the nonunion plans this year, reflecting rapid inflation in medical prices. The changes in Harvard’s health plans, and the issues negotiated at length in arriving at the HUCTW contract proposal, mirror broader workplace and national trends. The proportion of workers covered by employer-sponsored insurance with deductibles of $1,000 or more has shot up from 10 percent in 2006 to nearly half today. In general, health economists back cost-sharing designs, which they believe will encourage patients to become better consumers of medical care and help to contain inflation in medical prices. Data on whether cost-sharing has made Americans better healthcare consumers, though, have been mixed. A 2015 study found that after a firm moved 75,000 employees to high-deductible plans, they simply used less care, even when they needed it. This is the position HUCTW has taken on large-scale cost-sharing, which Jaeger called the “skin in the game” approach to healthcare. “Of all the pressures you can put on the system, patients seem the least able to withstand it. If we’re going to take market-based approaches, let’s put the pressure on prestigious hospitals that are price-gouging, not on patients to decide whether they can afford to do what their doctor tells them,” he said. Some 72 percent of HUCTW workers say that Harvard’s affordable health benefits are an “important factor” in their decision to stay at the University, and another 11 percent call it their “main reason.” Harvard’s health benefits remain some of the most generous in the region, and will continue to be an important tool for the recruitment of high-quality staff. Still, as cost-sharing expands nationally and especially at Harvard’s peer institutions, University workers appear likely to bear increasing responsibility for their own health costs.